The other day I was listening on the radio to someone who was talking about their smoking habit and I thought that it was an excellent example of how our choices dictate our lives. The person had said that he thought that smoking cigarettes defined who he was. He enjoyed smoking and nothing was going to make him quit smoking. Even when he had severe malaria and was seriously he continued to smoke. He said that he would drag himself outside and smoke a cigarette. One day after an extremely boring week at work he was climbing a hill and out of the blue the idea of quitting smoking popped into his head. Right there and then he chose to stop smoking. He buried all his cigarettes and lighter at the top of the hill. He said it was symbolic and that he had buried his cigarettes at the top of the hill because it was hard to get to. If ever he wanted to smoke again he would have to climb the hill which would make it difficult. He said that since that day he was fitter and healthier and no longer had to use smoking and cigarettes to define him. Now this is quite extreme and you certainly don’t have to go to the extremes that he did. 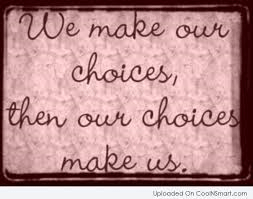 What it does illustrate is that it is your choices that determine your life. Everything is choices, be they good or bad, it’s all about choices. With regard to smoking the most important step to quitting is to choose. You can choose to do it in any number of ways. You can choose to quit smoking cigarettes with will power, drugs, acupuncture or with hypnosis. Whatever you do it’s your choice but the most important thing about quitting smoking is to make a choice. Next Electronic Cigarettes. Are they safe?